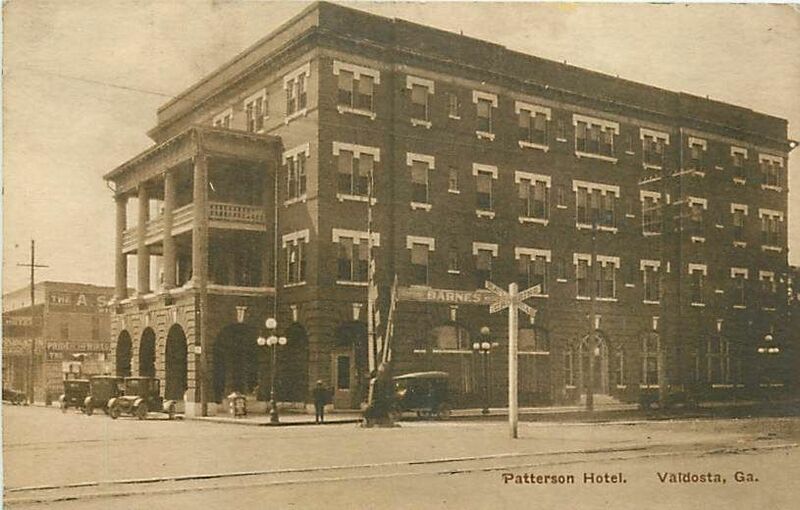 The Patterson Hotel, built by Lon Fender, opened for business on July 15, 1912 in Valdosta, GA. Lon Fender was involved in some biggest business deals in Wiregrass Georgia and in the history of Ray City, GA. He owned farmland near here in the 1920s and a turpentine still at Milltown (now Lakeland), GA. The Patterson Hotel, Valdosta, GA was built in 1912 by Lon Fender and Eugenia Devine. At the time it was the most luxurious hotel in south Georgia. The Patterson Hotel located at the corner of Patterson and Savannah Avenues was built on the site of another hotel, the Florence Hotel. It was torn down to make way for a parking lot. William Alonzo “Lon” Fender was a son of William Alfred Fender (1836-1920) and Susannah Allen (1841-1920). His father was a Civil War veteran and a farmer of the Naylor district, Lowndes County, GA, later moving to Ray City, GA. His wife, Texas Irene Hagan, was a daughter of Civil War veteran John W. Hagan and Mary Smith. The Fenders had a knack for the hotel business. Lon Fender’s cousin, William Seaboarn Fender, was an investor in the Valdosta Hotel Company. His brother, Wilson W. Fender, operated the Fender Hotel at Ray City. In 1911, Lon Fender partnered with Eugenia Prescott Devine (1850-1927), widow of William H. Devine (1849-1887) to build a modern brick hotel in Valdosta, GA. The Patterson Hotel Company was incorporated in 1912, with a capital stock of $25,000. This building, the Patterson Hotel, replaced the old Florence Hotel, where Ray City residents Benjamin L. Starling and Frank M. Byrd, stayed during the 1909 Carnival Week and the flight of the Strobel Air Ship. 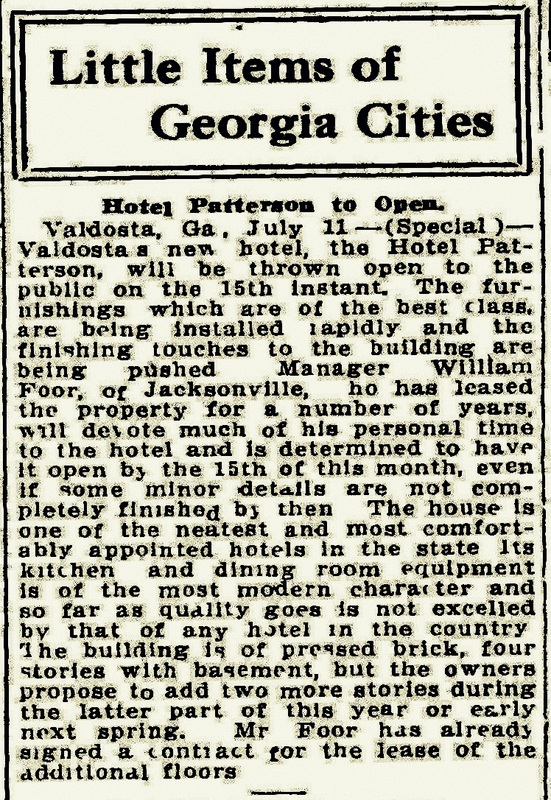 In 1911, The Valdosta Times reported that Lon Fender would build the Hotel Patterson. Work of Tearing Down the Old Florence will Begin as Soon as Possible. Within the next few days the old Florence hotel will be torn down to make room for a magnificent new hotel which is to go up in its place. If you want to buy the Florence almost at your own price, provided you will agree to move it off the ground which it now occupied without any delay. Work on the new hotel cannot commence until the old building is removed and it is decided to begin the work on the new one right away. Mr. W. L. Fender this morning closed a trade with Mrs. Devine by which he comes into possession of the ground now occupied by the Florence Hotel, extending eighty feet on Patterson street and two hundred and eleven feet on Savannah avenue. Mr. Fender is to be leading spirit in building the new hotel, but it is understood Mrs. Devine will be interested in the new building. Mr. Curran Ellis, the well known architect, has already prepared the plans for the new hotel and he was in the city this morning and submitted them to Mr. Fender and Mrs. Devine. The new hotel will be five stories and will be one of the handsomest structures of its size in the state. It will have between ninety and one hundred rooms and every room will have hot and cold water and most of the rooms will have baths attached. The building will have a handsome passenger elevator running from the lobby to the top floor. The hotel will have handsome columns extending out over the Patterson street sidewalk with a main entrance on Patterson street but with another entrance on Savannah avenue. There will be a store room on the corner of Patterson street and Savannah avenue to be occupied by a drug store while there will be another store room on the west side of the building to be occupied as an up-to-date cafe. Between these two store rooms will be a colonnade leading to the office and lobby. The kitchen will be on the southwest corner of the building and the dining room will be on the west side as the present one in the Florence hotel. The maid p—- —- be on the second floor and on the east side, leading to a large veranda overlooking Patterson street. The building is to be equipped in the very best of styles and it is to be a credit to a town of twenty-five thousand people. Mr. Fender and Mrs. Devine have already had flattering offers from well known hotel men for a lease of the building. Mr. Ellis, the architect is expected to have the working plans completed within a day or two and it is understood that the contract for the work will be let just as soon as possible. Prominent contractors were here this morning figuring on the new building. The completion of this new hotel will be the biggest work done in Valdosta during the present year. It will transform the appearance of the city and will give passengers on all of the roads a good view of the imposing structure. Valdosta, Ga., May 5. -(Special.) 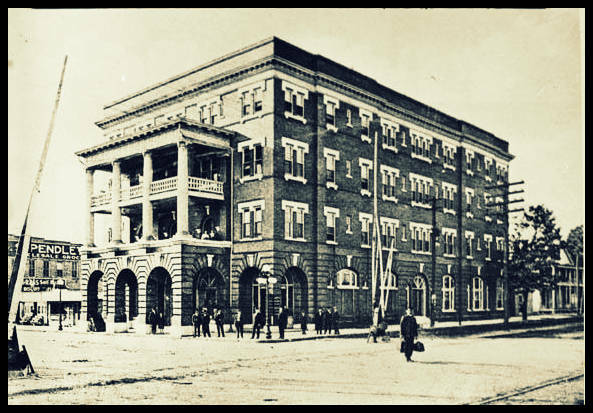 – William Foor, proprietor of the Aragon hotel at Jacksonville, Fla., yesterday closed a ten-year lease for the handsome new hotel built by W.L. Fender and Mrs. Devine in this city. The terms of the lease have not been made public, but a very satisfactory price was received by the owners. The new hotel will open about the 20th of June.The building will be ready for the furnishings within the next few weeks.There are few hansomer hotels in this part of the state than the new structure. The owners of the Valdes hotel have announced their intention to enlarge and refurnish the hotel as soon as the lease of Mr. Ferrell, the present manager, expires in September. The proposed improvements will make the Valdes probably the most handsome hotel in southern Georgia, and will place Valdosta in the front rank in hotel accommodations. Atlanta Constitution, July 12, 1912. The Hotel Patterson prepared for a grand opening on July 15, 1912. Valdosta, Ga. Valdosta’s new hotel, the Hotel Patterson, will be thrown open to the public on the 15th instant. The furnishings which are of the best class, are being installed rapidly and the finishing touches to the building are being pushed. Manager William Foor of Jacksonville, who has leased the property for a number of years, will devote much of his personal time to the hotel and is determined to have it open by the 15th of the month, even if some minor details are not completely finished by then. The house is one of the neatest and most comfortably appointed hotels in the state. It’s kitchen and dining room equipment is of the most modern character and so far as quality goes is not excelled. The building is of pressed brick, four stories with basement, but the owners propose to add two more stories during the latter part of the year or early next spring. Mr. Foor has already signed a contract for the lease of the additional floors. In early November 1909, people from all around the state began to pile into Valdosta, Georgia. They came from Naylor, Council, Nashville, Adel, Sparks, Milltown (Lakeland), Hahira, Statenville, Quitman, Cairo, Bainbridge, Mineola, Tarver, Alexanderville, Howell, Dupont, Broxton, Hawkinsville, Thomasville and Camilla. They came from Atlanta and Macon and Savannah. Up from Florida, they came from Hampton, Lake City, Jasper, Jennings, White Springs, Madison and Jacksonville. They came from Kentucky, New York, and Washington, D.C. They had come to see the great carnival held in Valdosta November 9th to 13th. The carnival promised exhibits of trained animals, a dog and pony show, “the Human Butterfly”, free exhibition by “the Clown Elephant” on the streets of Valdosta, an automobile Calliope, and two brass bands. Most especially, they had come to see the Strobel Airship – the first flying craft ever to visit this part of the country – billed as “the greatest attraction ever seen here”. All the railroads offered excursion rates with daily round trips. From Ray’s Mill, Georgia came B.L. Starling and F. M. Byrd. The 1910 Census shows Frank Byrd was a ‘machinist’ living in the Ray’s Mill District. Benjamin L. Starling was a farmer renting a farm in the 1157 Georgia Militia District, near the farms of Harmon L. Floyd, William Outlaw and Lucius Galveston Outlaw (L. G. Outlaw’s place became known as the J. C. Rowan place). 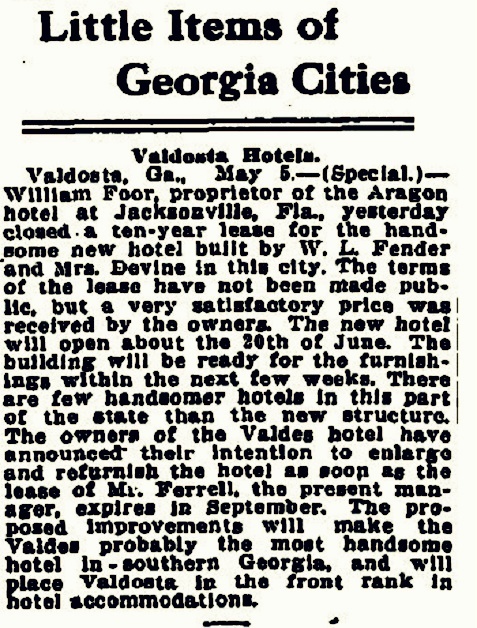 Starling and Byrd arrived on Saturday, November 6, 1909 and, like many of the visitors, stayed at Valdosta’s Florence Hotel. 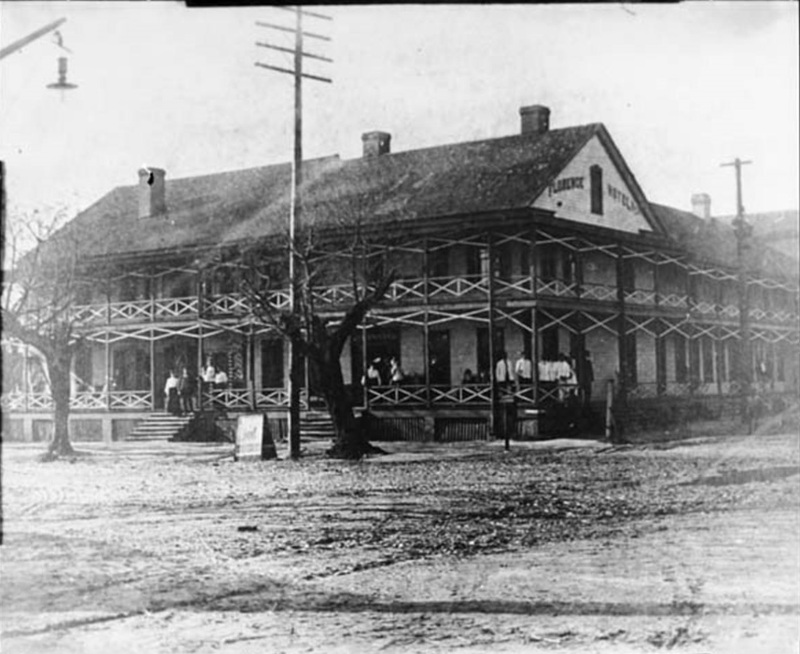 The hotel was located on South Patterson Street, Valdosta GA just across the street from the railway depot. The location was ideal because the train station was the site where the Strobel Airship would be launched. Just one year earlier 25,000 spectators watched a pilot of one of the Strobel Airships plunge 500 feet to his death, after the hydrogen filled aircraft burst into flames during a flight at a county fair in Waterville, Maine. But after several delays, the crowd in Valdosta witnessed what was an impressive and successful flight. There was more rubber-necking in Valdosta today than all the people in the old town ever did before in all of their lives. The reason: The airship went up. Although the weather four or five hundred feet above the surface of the earth was rather stiff for a successful flight, Prof. Owens sailed over a considerable portion of the town, remaining in the air about fifteen minutes. The ascension was made at 12:15. Promptly at twelve o’clock the aerial bomb which is exploded just before flights, was set off and fifteen minutes later the ship was in the air The bomb will notify the people each day when to look for the ship. When you hear the bomb the flight follows within 15 minutes and the entire town will be circled each day. 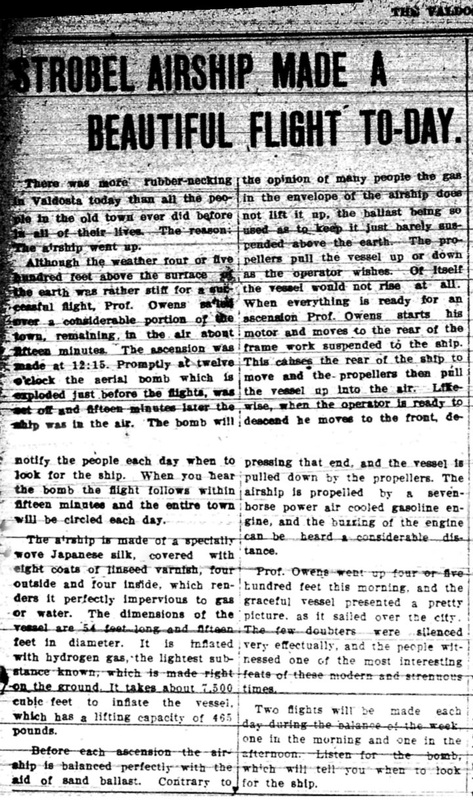 The airship is made of a specially wove Japanese silk, covered with eight coats of linseed varnish, four outside and four inside, which renders it perfectly impervious to gas or water, the dimensions of the vessel are 54 feet long and fifteen feet in diameter. it is inflated with hydrogen gas, the lightest substance known, which is made right on the ground. It takes about 7,500 cubic feet to inflate the vessel, which has a lifting capacity of 465 pounds. Before each ascension the airship is balanced perfectly with the aid of sand ballast. Contrary to the opinion of many people the gas in the envelope of the airship does not lift it up, the ballast being so used as to keep it just barely suspended above the earth. The propellers pull the vessel up or down as the operator wishes. Of itself the vessel would not rise at all. When everything is ready for an ascension Prof. Owens starts his motor and moves to the rear of the frame work suspended to the ship. This causes the rear of the ship to move and the propellers then pull the vessel up into the air. Likewise, when the operator is ready to descend he moves to the front, depressing that end, and the vessel is pulled down by the propellers. 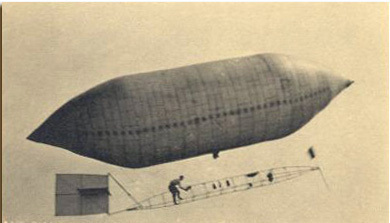 The airship is propelled by a seven-horse power air cooled gasoline engine, and the buzzing of the engine can be heard a considerable distance. Prof. Owens went up four or five hundred feet this morning, and the graceful vessel presented a pretty picture, as it sailed over the city. The few doubters were silenced very effectually, and the people witnessed one of the most interesting feats of these modern and strenuous times. Two flights will be made each day during the balance of the week, one in the morning and one in the afternoon. Listen for the bomb, which will tell you when to look for the ship. After further research it seems that the listing of T.M. Byrd at the Florence Hotel during the flight of the Strobel Airship was most likely a typographical error. Starling’s companion must have been Frank M. Byrd (F.M. 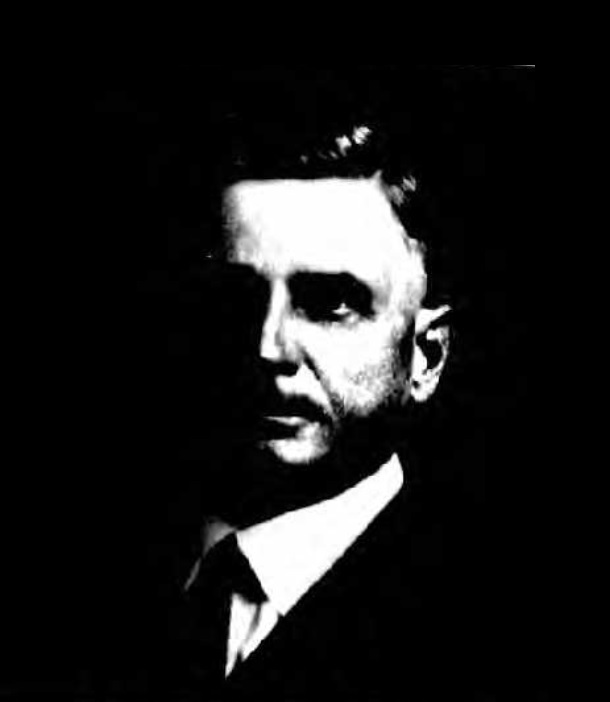 Byrd)and the F. was mistaken for a T. Both Benjamin L. Starling and Frank M. Byrd were residents of the Ray City area and had similar agricultural interests.